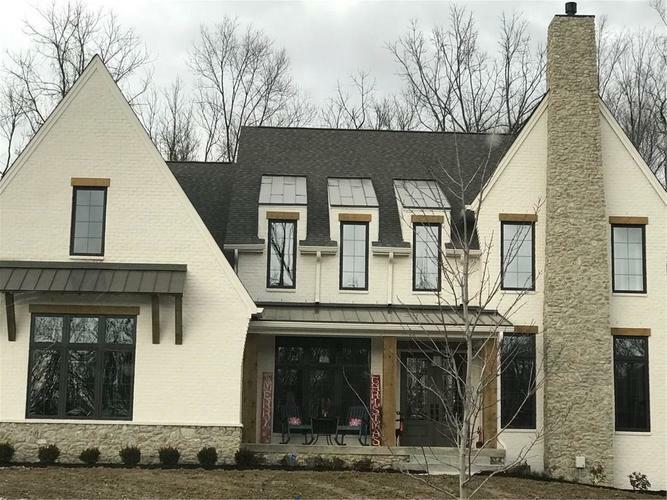 Custom built Estridge home in Oxford Woods. Grand entry opens to two-story den/library w/fireplace & gorgeous judges paneling. Great room w/ beautiful wood wrapped beams and wood-burning fireplace opens to kitchen featuring Shaw engineered hardwood floors, center island with granite countertops, and Haas Revere Maple painted cabinets. Bathrooms boast Quartz countertops. Bedroom on main, too. Lanai siting area perfect for relaxing and entertaining. Incredible master suite w/ sitting area. Additional bedrooms, huge bonus room, and laundry upstairs, too. Basement features exercise room and family room with wet bar. Directions:465 W to Michigan Rd/SR 421 north to Oxford Woods neighborhood entrance/Walton Cres. Follow straight back - home is 2nd on the left in the cul-de-sac.